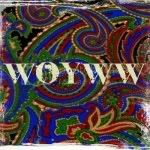 Happy Wednesday y'all and welcome back to another edition of WOYWW. I have been hard at work catching up on art journal pages and ATCs but I took a break and broke out my Gelli Plates® for a little play! I ordered a new 3x5 gelli plate® a few weeks ago but haven't had a spare moment to play with it. It was all pretty and shiny in the box though! I'm doing a gelli print swap with an IG friend and needed some more prints than what I had on hand. On the left side of the desk you can see a selection of craft paints and the box I keep all of my Unity Stamp Co. Stamps of the Week and my now completed #30DaysofLists journal. 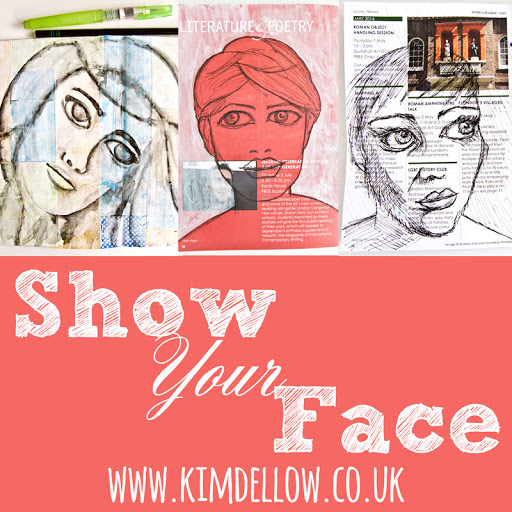 On the newspaper you'll find my 8x10 Gelli Plate®, a Catalyst tool, my 3x5 Gelli Plate® and my brayer. Oh, and the bag clip at the top? Confiscated from the toddler because she was dragging it through wet paint trying to be like Mommy with her brayer. The spoon too. The orange and blue striped thing you can see is a piece of drywall tape I used for texture. Works great! Some ATC bases, my ever present baby wipes, and more paint! This little break was just what I needed! Thanks for stopping by today! 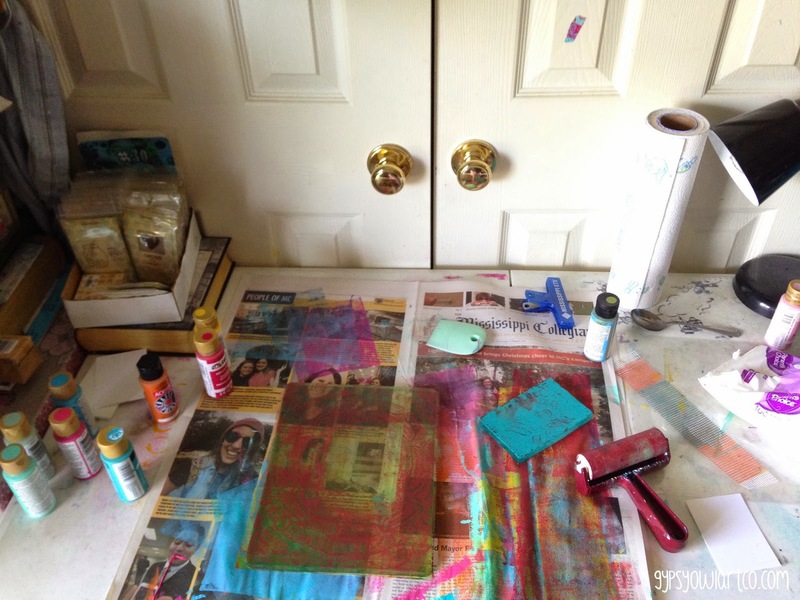 For more nosy fun, head on over to Julia's to check out some other messy desks! Have a great day. Now go make some art! Just love your prints! I've seen so much gorgeous work done with the Gelli plates. Happy Easter and Happy WOYWW! I also love the gelli plate. Your prints look very nice! Loving those prints - what wonderful backgrounds those can make. 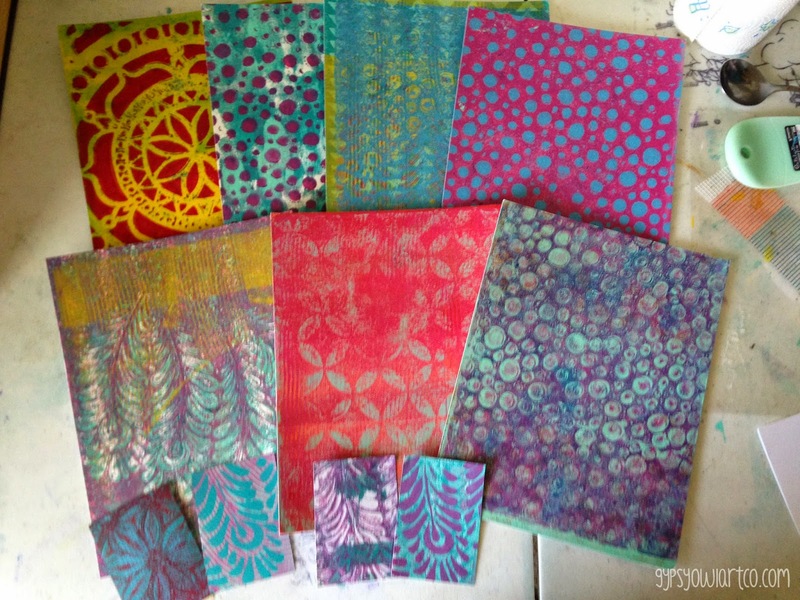 Fab Gelli prints! It's kind of addictive ~ in the best sort of way ~ isn't it? I love my gelli plates and I have 3 of them and your prints are brilliant. What sort of paper do you use to print onto? Thanks for sharing and I hope you have a wonderful Easter.